“Greeen graass!” shouted Goldie from the roosting pole. Her four sisters awoke and ruffled their feathers. “Buuock! You’ll give us a heart attaaack! I thought the house was on fire,” said Blondie. Blackie flew down from the roost for water and food. Silver followed. They pecked together at the grain. Goldie, Brownie, and Blondie joined Blackie and Silver for breakfast. “Do you remember the sheeep and cooows at the other farm?” asked Blondie. “Ooold Mo’s never come close enough to us to say so, but I think he would like some company,” Goldie said. “He’s a caat of few words,” Silver observed. "Cackle, cackle, cackle!” the five sisters burst out laughing, for they talked from sunup to sundown. Sometimes before and after. Just then, they heard Lem open the door. “Buuock!” the hens answered and gathered at the screen door between them and Lem. The hens gobbled up their treat while Lem replaced their water container with a fresh one. He scooped more grain from the can and filled their feeder. “There’s more snow coming, girls,” Lem said and closed the door. The hens squawked in disapproval of the news. They went through the chute and into the pen to watch Lem walk up the green hill. “I’m glaad I’m a chicken,” Blondie said. “Bock bock!” said her sisters. 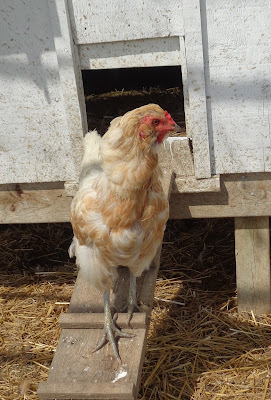 Blondie disappeared under the hen house for an overdue dust bath. The five hens scratched and pecked what they could before snow fell again, all the while talking and laughing the day away.